Leather Zipper Pull. Embroidered Pony Logo on Left Chest. 100% Cotton. Mock Neck Collar. Ribbing at Neck, Cuffs, and Hem. TH Flag on Left Chest. Full Zip Closure. 100% Cotton. Mock Neck Collar. Half Zip Closure. Ribbing at Neck, Cuffs, and Hem. TH Flag on Left Chest. 100% Cotton. Ribbed crew neckline. 100% Cotton. Hand wash. Embroidered Pony Logo on Left Chest. Ribbed hemline. Item: Tommy Hilfiger Mens Sweater V Neck Oversized Varsity 85 Blue White Sz XXL Size: XXL - please see measurements for this sweater, there is no size tag on item. Measurements: (ALL MEASUREMENTS ARE APPROXIMATE) Pit to Pit: 27" Length: 36" Condition: New without tags Please do not hesitate to reach out with questions. Thanks so much for your continued support! . 78% Lambs Wool/22% Nylon. Button Close. TH Flag on Left Sleeve. 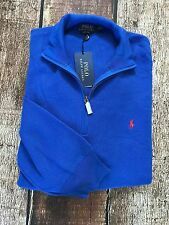 Men's Blue Vilebrequin Crew Neck Long Sleeved Sweater Jumper Size Medium. Men's sweaters are knit garments that are worn either alone or over a shirt. They are designed to add warmth and insulation. Many sweaters feature decorative elements, such as cables, ribs, or Fair Isle designs that add visual interest to the garments. What styles of men's sweaters are available? Cardigan: A cardigan opens all the way down the front. It may use snaps, toggles or buttons as closures. The buttons start at about mid-chest, leaving the upper part open so that the shirt underneath can be Seen. They may have pockets integrated into the side panels. Some men tie this type of sweater over their shoulders and wear it like a shawl. Zippered: There are sweaters for men with a half-length or full-length zipper down the front. Turtleneck: This style extends up to the wearer's chin. It is usually folded over to provide a double layer of fabric around the neck. Crew and V-necks: A crew-neck pullover has a ribbed neckline that forms a circular shape for the head opening and is worn close to the neck. A V-neck pullover is shaped like a "V" in the front, and its edges are ribbed with tighter knit stitches to keep warmth in. Cardigans also have a V shape in the front. What materials are men's sweaters made from? Wool and wool blends: Wool is a traditional material for men's cardigans and pullovers. Blue-faced Leicester, merino and lambswool may be used in men's sweaters. Wool is sometimes blended with cotton for warmth and ease of laundering. Cotton and cotton blends: Cotton and cotton blends are often used in men's casual sweaters. Over time, cotton relaxes as its fibers stretch. Cashmere: Cashmere is the fiber of a cashmere goat. It is soft, hypoallergenic and warm. It is available in natural and dyed colours. Acrylic: Acrylic is a man-made material that is easy to wash and can be machine-dried. It does not shrink or stretch. Acrylic knit cardigans and pullovers are available in a full range of colours. How do you choose a size of men's sweater? 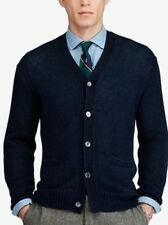 Most manufacturers offer men's cardigans and pullover sweaters in sizes that range from extra-small to 3XL. You will need several body measurements in order to select the size of knit top that fits. It is important to take the measurements while wearing any garment that would be worn underneath the sweater. Take the neck, chest and waist measurements in inches. For the sleeve length, measure on the outside of the arm from the top of the shoulder to the end of the wrist. A man's extra-small sweater fits a neck size of 13 to 13 1/2 inches, a chest size of 33 to 34 inches, a waist size of 27 to 28 inches, and a sleeve length of 31 1/2 to 32 inches. For each 1/2 inch increase in neck size or arm length, or 2-inch increase in chest or waist size, go up one size. If you are between sizes, choose the larger size.